Have you noticed the Pelvic floor is a little less able to do its job than it used to? Coughing, sneezing, and not able to stop a little leakage? Are you leaking after jumping, or when you move suddenly? You do NOT have to put up with this. Let me help you to help yourself regain the strength in your pelvic floor and take back control. Women who want to learn more about her own Pelvic Floor, Core and overall health. Women who are going through, or have been through the menopause and have notice a difference to their pelvic floor and want to do something about it. Women who when they need to ‘go’ the need to ‘go’! Women who have had the odd leak when jumping, running, coughing or sneezing and know that that’s a sign that you need to take control of your Pelvic Health. Women who have ‘lower back pain’ issues that you’ve been told is due to a ‘weak Core’? Women who are ready to prioritise this area of your health and learn ESSENTIAL skills to last a lifetime. Women who have seen a clinician about a low level Prolapse and been told to ‘do your Pelvic Floor exercises’ as part of your management strategy? Does this sound like you? Then this course is for you. 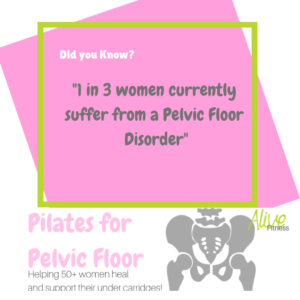 The ALIVE Pilates for Pelvic Floor courses run a number of times throughout the year. The numbers are strictly limited to 8. Please sign up and get the first chance to take a place at the next course. I am ready to be enlightened, CLICK HERE to pay for the course. Alive’s Pilates for Pelvic Floor course provides you with 4-8 weeks of movement, nutritional guidance and education regarding your Pelvic Floor, Core and women’s wellness. The programme is split into two phases; for the first 4 weeks you will attend weekly classes with a focus on reconnecting with your pelvic floor and mastering the progressive exercises. Alongside this you will have support on nutrition, and overall wellness too. There is a homework portal on the Alive website showing you exercises to do at home and plenty of support between sessions. After these initial 4 weeks the programme will move online with full support in a special private and confidential facebook group, where we will focus on helping you integrate core and pelvic floor exercise into your everyday life. Helping you to remember to practise the exercises and give you full support to help you to create healthy habits. This second phase is optional but comes highly recommended if you want to continue to build on your foundation. A thorough online health assessment to see if the programme is right for you, if it is not right for you currently, I will refer you a good reputable local women’s health physio. Four 60 minute sessions including releases, posture work, functional movement and education. With lots of shared stories fun and chatter. An ALIVE Pelvic Floor Education handouts. Access to the online platform for homeworks (all filmed). Homework will typically be 4-5 times a week for approx. 10-20 minutes. Nutritional advice to assist with Pelvic Floor and Core strength. Support between each sessions via facebook group with me to keep you on track and for your group to encourage each other and stay accountable.